Sean Rafferty presents a lively mix of music, conversation and arts news. 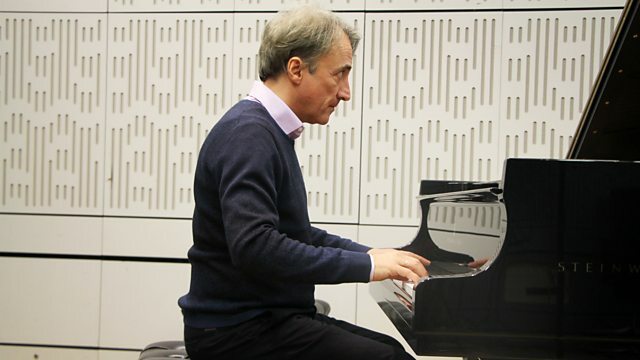 Today's guests include pianist Jean-Efflam Bavouzet and Emma Johnson. Sean Rafferty presents a lively mix of music, conversation and arts news. Today we hear a live performance from pianist Jean-Efflam Bavouzet ahead of his Wigmore recital on the 10th February. British clarinettist Emma Johnson also joins us for a live performance before heading to Guilford on the Saturday 9th February where she will perform works by Brahms and Mozart. And finally, we meet Andrea Tarsia the curator of The Royal Academy of Arts' new Exhibition: Bill Viola / Michelangelo: Life Death Rebirth. Performer: Emma Johnson. Performer: Philip Gibbon. Performer: Peter Francomb. Performer: Chris West. Music Arranger: Emma Johnson. Ensemble: Carducci String Quartet. Performer: Graham Johnson. Singer: Anthony Rolfe Johnson. Britten: Canticle 1/Michelangelo sonnets etc: Johnson/Johnson. Orchestra: Royal Concertgebouw Orchestra. Conductor: Bernard Haitink. Brahms: Hungarian Dances &Dvorak: Slavonic Dances: Haitink. Orchestra: BBC Symphony Orchestra. Conductor: Rudolf Kempe. Orchestra: City of Prague Philharmonic Orchestra. Conductor: Paul Bateman. 100 Greatest Film Themes, Take 3. Performer: Dalton Baldwin. Singer: Elly Ameling. Orchestra: Royal Scottish National Orchestra. Conductor: Neeme Järvi. Performer: Emma Johnson. Performer: John Lenehan. Performer: Emma Johnson. Performer: Philip Gibbon. Performer: Peter Francomb. Performer: Matthew Denton. Performer: Eoin Schmidt-Martin. Performer: Emma Denton. Performer: Chris West. Orchestra: Australian Brandenburg Orchestra. Director: Paul Dyer. 30 minutes of uninterrupted music - on air every weekday at 7pm and online at any time.